Tuesday • March 20 • 2018 Volume 85• Number 12 bp INSIDE: ? Campbell’s Supply ? Employment Presorted Standard US Postage Paid Permit #8 ECRWSS Vermillion, SD ? Menards ? Bomgaars ? Sears Postal Patron Local Since 1934 201 W. Cherry ? Vermillion, SD 57069 ? Phone: 605-624-4429 ? Fax: 605-624-2696 ? www.broadcasteronline.com MARK’S MACHINERY, INC. March Parts Sale!! y et An ill Me rices W * We tised P -IH ver Case Ad uine cants Guaranteed Lowest Prices of 2018 en On G & Lubri * All Prices Good Thru March 31st, 2018 Parts * Buy Genuine Parts at “Will Fit” Prices * STOCK UP NOW - SAVE $$ FILTER SALE FREE Case-IH Cap With All Parts Orders of $250 & Up GENUINE PARTS All Genuine CASE-IH Filters Protect Your Equipment Investment 120 DAYS NO INTEREST SAME AS CASH! - CNH CAPITAL Free CaseIH Cap with $250 Purchase $50 CNH Gift Card with $500 Purchase of Filters and Lubricants 15% OFF ALL FILTERS ALL CASE-IH FILTERS ON SALE! - ENGINE OIL - FUEL - AIR - CAB -WATER FILTERS - HYDRAULIC FILTERS TRACTORS - COMBINES - WINDROWERS MAKE A LIST - STOCK UP NOW! NO BETTER WAY TO SAVE 15% ON YOUR 2018 INPUT COSTS DISC BLADES 15% OFF Genuine CASE-IH Blades - Earth Metal - Blades In Stock - For Most Makes -INCLUDES TURBO-TILL BLADES - 15% OFF SWEEPS IN STOCK FOR ALL CASE- IH CULTIVATORS OFF 2 for $156 9 ft. balanced HD • Precision Farming • •Auto Steer Equipment & Signal Options •Sales • Service • Training • Install •Combine Mapping - Planter Equipment Lots of Exciting New Products! 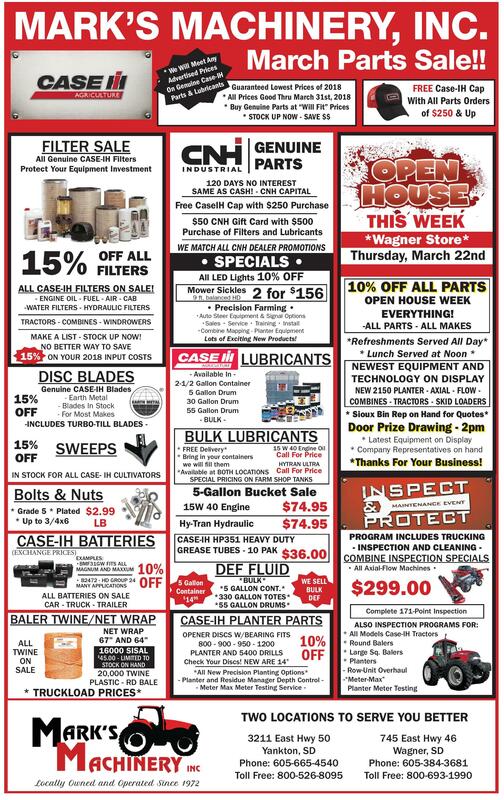 LUBRICANTS - Available In 2-1/2 Gallon Container 5 Gallon Drum 30 Gallon Drum 55 Gallon Drum - BULK - 10% OFF ALL PARTS OPEN HOUSE WEEK EVERYTHING! -ALL PARTS - ALL MAKES *Refreshments Served All Day* * Lunch Served at Noon * NEWEST EQUIPMENT AND TECHNOLOGY ON DISPLAY NEW 2150 PLANTER - AXIAL - FLOW COMBINES - TRACTORS - SKID LOADERS * Sioux Bin Rep on Hand for Quotes* BULK LUBRICANTS 15 W 40 Engine Oil * FREE Delivery* Call For Price * Bring in your containers HYTRAN ULTRA we will fill them *Available at BOTH LOCATIONS Call For Price SPECIAL PRICING ON FARM SHOP TANKS Hy-Tran Hydraulic CASE-IH BATTERIES (EXCHANGE PRICES) EXAMPLES: •BMF31GW FITS ALL MAGNUM AND MAXXUM • B2472 - HD GROUP 24 MANY APPLICATIONS 10% OFF BALER TWINE/NET WRAP ALL TWINE ON SALE All LED Lights 10% Mower Sickles 15W 40 Engine $2.99 LB ALL BATTERIES ON SALE CAR - TRUCK - TRAILER • SPECIALS • *Wagner Store* Thursday, March 22nd Door Prize Drawing - 2pm * Latest Equipment on Display * Company Representatives on hand *Thanks For Your Business! 5-Gallon Bucket Sale Bolts & Nuts * Grade 5 * Plated * Up to 3/4x6 WE MATCH ALL CNH DEALER PROMOTIONS THIS WEEK NET WRAP 67” AND 64” 16000 SISAL 45.00 - LIMITED TO STOCK ON HAND $ 20,000 TWINE PLASTIC - RD BALE * TRUCKLOAD PRICES* $74.95 $74.95 CASE-IH HP351 HEAVY DUTY GREASE TUBES - 10 PAK $36.00 5 Gallon Container $ 1495 DEF FLUID *BULK* *5 GALLON CONT. * *330 GALLON TOTES* *55 GALLON DRUMS* PROGRAM INCLUDES TRUCKING - INSPECTION AND CLEANING - COMBINE INSPECTION SPECIALS • All Axial-Flow Machines • WE SELL BULK DEF CASE-IH PLANTER PARTS OPENER DISCS W/BEARING FITS 800 - 900 - 950 - 1200 PLANTER AND 5400 DRILLS Check Your Discs! NEW ARE 14” *All New Precision Planting Options* - Planter and Residue Manager Depth Control - Meter Max Meter Testing Service - 10% OFF $299.00 Complete 171-Point Inspection ALSO INSPECTION PROGRAMS FOR: * All Models Case-IH Tractors * Round Balers * Large Sq. Balers * Planters - Row-Unit Overhaul -“Meter-Max” Planter Meter Testing TWO LOCATIONS TO SERVE YOU BETTER 3211 East Hwy 50 Yankton, SD Phone: 605-665-4540 Toll Free: 800-526-8095 OUR DATA SPEAKS VOLUMES What does this mean? It means that, as a publication audited by Circulation Verification Council (CVC), we have a clear understanding of our impact, including the number of households we reach, how much we’re read and our influence on purchasing decisions. When it comes to serving readers and advertisers, CVC is the standard. Put your trust in the Broadcaster Press, audited by CVC. Broadcaster Press 745 East Hwy 46 Wagner, SD Phone: 605-384-3681 Toll Free: 800-693-1990 All Flexsteel On Sale! 109 East Third, Yankton 605.665.4416 • 800.798.4663 Monday-Friday 10-6, Saturday 10-5, Evenings by Appointment www.hatchfurniture.com Including Special Orders!! Up To 48 Months Special Financing* *See store for details. Ends March 27th.